Today, Sri Lankans make up the eighth largest immigrant group in Victoria, with 43,991 people recorded in the 2011 census. The community is culturally diverse, reflected in the languages spoken at home: 53% speak Sinhalese, 16% speak Tamil, and most others speak English. Religious diversity follows a similar pattern, with 42% Buddhist, 12% Hindu and 40% Christian. 37% of the Sri Lanka-born population in Victoria are tertiary educated and are employed as managers and professionals; 25% work in clerical, sales and service; and many others work in trades, production and transport. So it’s pleasing to see that Australia has another author from the Sri Lankan diaspora to join the award-winning Michelle de Kretser, and by the look of this debut, Rajith Savanadasa has a great future as an author ahead. 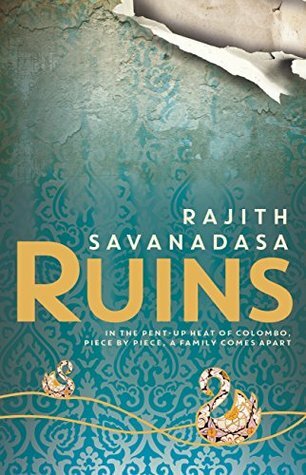 Set in Colombo in the aftermath of the civil war, Ruins is a story of a family in crisis. The generations are in constant conflict over issues big and small, and the old familial certainties don’t seem to fit into the new way of life in a city in transition. Anoushka is suffering the travails of teenage years, trying to cope with the torment of friendship issues; she has a yearning for an iPod so that she can listen to the kind of music she likes (and her parents disapprove of); Niranjan is hoping to make big money out of his start-up company but he’s hanging around with the wrong crowd. His father Mano is struggling professionally as journalism falters not only because of the digital age but also because of political corruption; Mano’s been neglecting his wife Lakshmi too and she’s got herself tangled up in a risky quest to find a missing Tamil boy. Savanadasa introduces his Australian readers to an unfamiliar world, one which is strictly gendered, class-based and overtly racist. The book is narrated by each of the five central characters, beginning with the servant Latha whose sense of social inferiority is reinforced in all her daily interactions. Waiting to chaperone Anoushka home after school, Latha knows that Anoushka doesn’t want to be seen with her. For Latha, the Herath family is her only family. She has only recently discovered that she has a brother, a brother who only comes to visit because he wants her to come home and wait on his wife while he works overseas in Dubai. Her sister Akka used her too. But although she thinks the Heraths are a good family, no one shows her any respect or affection. She works seven days a week for a pittance, and there is no certainty that she will be allowed time off to attend her nephew’s funeral. The only reason Lakshmi is kind to her is because she, a devout Buddhist, believes she needs to build up meritorious deeds to ensure an auspicious reincarnation. Niranjan is at that age when self-delusion suggests that quick money is easier than getting a proper job, the job his parents expect him to get after the expense of sending him to Australia for his education. I predict that most readers will have a good chuckle when the nature of his start-up company is revealed. The terrible fate of a mother is that her child will one day leave. At first they seem close but boys are forever drifting away, just to trouble their parents. Ever since he got back from Australia, Niranjan’s been doing things to try and upset me…. As you can see from the extract above, Savanadasa sprinkles his text with Sinhalese and Tamil expressions, but it is so skilfully done that the reader can always work out the meaning from context. The setting is different enough to be interesting to readers like me who haven’t been to Sri Lanka, but it’s not exoticised. The characterisation is vivid, and the narrative drive is sustained as the plot layers build up. In the end it’s Latha who makes sense of her world even though she has no illusions left. I really enjoyed Ruins. Highly recommended. Source: Review copy courtesy of Hachette. or direct from Hachette where it is also available as an eBook. Your immigration figures confirm why the Sri Lankan cricket team always has lots of support at the MCG. I can understand why a writer would investigate his roots, but do you think this is an ‘Australian’ book. Well, I doubt if it’s eligible for the Miles Franklin, but it’s ‘Australian’ in the way that Anglo-Indian books by people like V S Naipaul are British. It brings us the world that this community comes from, the world that shaped it. Worth knowing about, especially since it comes wrapped up in an engaging story. There is a strand of Australian-ness in the story of the missing Tamil fighter, but I shall say no more about that! Reading about the history of Australian writing in A Brief Take on the Australian Novel suggests that ‘Australian’ writing had a British sensibility. Even when they wrote about what they saw here, they saw it through a British lens. We can see this most clearly in early Australian art where the trees are all wrong, and the colours even more so. We recognise this because we are so familiar with British art and culture that we can identify it in our own art and culture. So… when it comes to reading contemporary Australian fiction, do we need to be more familiar with the source countries of our writers? The short answer of course is Yes, we should be more familiar with source countries. I’m sure Black Rock, White City, for example, whose protagonists after all were Yugoslav literature academics, contains allusions of which I was completely unaware. As for ‘saw it through a British lens’ Australian writers up to WWI at least were working within the British market …. but that’s a subject which needs a whole essay! – maybe it could be called The Impressionist Movement in Australia. and realising that I was the only person in the classroom who had ever actually seen a field of daffodils. Oh, we will never be able to pick up all allusions I reckon, Bill, even in our own literature. I guess that’s partly why every reader in the end reads a different book, isn’t it! Oh, you are cheeky Lisa! I may or may not take this up – but first I must read Vernay obviously! I had a laugh when I saw this post come through last night, because we had just had friends over to dinner, one of whom had just been to Sri Lanka. She loved it. Must tell her about this book. I’ve just started this & loving it so far. I skipped through to see your highly recommended sign off & will come back when I finish for a closer look. I was fascinated by how Savanadasa allowed me to change allegiance at different points in the story. Clever!